Microcredit, pioneered by Dr. Muhammad Yunus in 1976, is the concept of using small loans made at affordable interest rates to transform the lives of impoverished people, mostly women. Since its inception 42 years ago, the concept has empowered millions of poor people around the world to lift themselves out of poverty, take better care of their families, and make more meaningful contributions to society. At Nested Savings, we share the belief that given access to the right resources, impoverished people can lift themselves out of poverty. This belief is the driving force behind our Village Egg Bank in Egg Currency (VEBEC) project which since 2015, has provided a loan of resources to about 80 rural farmers in Yumbe, enabling them to venture into poultry farming and earn at least $2 a day. During our VEBEC impact assessments, we noticed a rather interesting trend: Most of our beneficiaries were planning to reinvest the savings accrued from their poultry businesses into bigger entrepreneurial ventures in order to further advance their progress towards food and financial security. Impressed, we decided to create the Alternative Livelihood and Financial Inclusion (ALFI) Fund to provide seed capital to our beneficiaries and other members of the Yumbe community, especially women, who have good business ideas. This was our first attempt at giving our cash loans. With support from the French Embassy in Uganda’s Social Development Fund, we provided loans to an initial number of 20 entrepreneurs and realized a loan payback rate exceeding 95%. As of July 2018, the ALFI Fund is supporting nearly 100 clients with a revolving amount of nearly $2,500 i.e. 8.5 million Ugandan shillings. One of the beneficiaries of this fund is Anguparu Janet, an entrepreneur in Yumbe Town Council who specializes in knitting sweaters for sale. She previously borrowed from other financial institutions with higher interest rates. 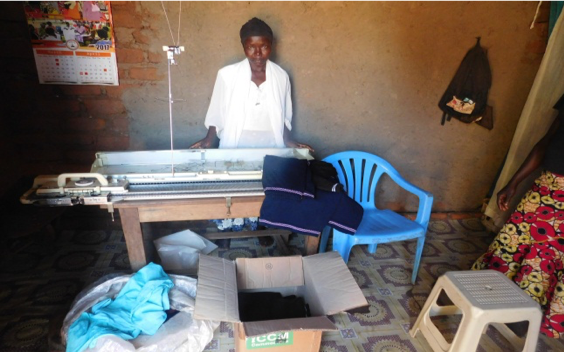 However, after learning about the ALFI Fund, she took a soft loan from Nested Savings to invest in her business. Today, she is growing her sweater business and putting herself in a better position to support her family. We are excited about growing this fund through reinvestment and external support because we have seen firsthand how transformative these small loans can be for rural development. Special thanks to the French Government for making the ALFI Fund possible through its embassy in Uganda, and to the Resilient Africa Network East Africa Lab for providing funding for our VEBEC project. Janet posing with some of her products in her shop in Yumbe Town Council.